Israeli soldiers killed, on Friday evening, a Palestinian teen, only 17 years of age, from Silwad town, east of the central West Bank city of Ramallah, and wounded another Palestinian, in addition to moderately injuring a young man in ar-Reesan Mountain area, west of Ramallah. 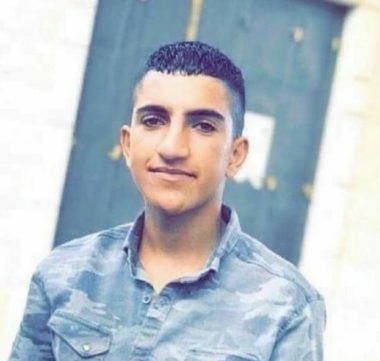 Palestinian medical sources said a soldier, stationed in a fortified military tower, shot Ayman Ahmad Othman Hamed , 17, from Silwan town, with a live round in his chest. The soldier was in the fortified military tower, which was installed by the army near Ein Yabrud nearby village. After shooting the Palestinian, several soldiers surrounded him, and later allowed Red Crescent medics to approach him. His corpse was then moved to Palestine Medical Complex in Ramallah. The soldiers also shot young man with a live round in his arm, before he was rushed to a hospital.